Bauen: Where I pretend to be an economist. Where I pretend to be an economist. This graph must mean something, but I just don't know what. 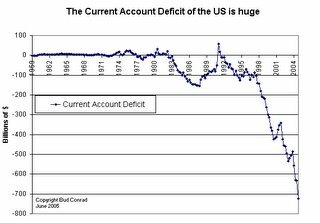 All kidding aside, the precipitous decline in our trade deficit means that there must be a serious macroeconomic adjustment made to the American economy. What that specifically is or when that will happen, I don't know. I can't even provide probabilities for a time frame. "What I'm looking for in international standards that can be enforced--which means international governments--is a way to help assure that the gap between the have and have-nots doesn't widen." Now, let's assume trade liberalisation is total. Imagine no barriers to free trade. Now, it seems to me that American hegemony would have to decline, because eventually our competitive and absolute advantages would all disappear. Eventually most inequalities between nations would converge. The only essential differences that might never change would be environmental. The Middle East will probably always have an absolute advantage in oil productions. However, even advantanges based on environment can be neutralized by other country's development of technology. Petro-states will eventually lose their advantage when alternative energy sources are invented. Labor is a non-factor as well. Eventually every country will have a good education system that will develop equally innovative and hardworking people as the US or India or China. I'm thinking of the fact that high tech companies like Microsoft, Cisco, and IBM are investing heavily in R&D in India, China, and even Eastern-bloc countries like Serbia. Basically what it comes down to is that people all over the world are essentially the same. No denizen of America has an essential (necessary) trait that gives them an absolute advantage over others in China, Russia, India, or Poland. Everyone works essentially equally hard, and everyone is essentially equally inventive/intelligent/creative. Thus, the only two major variables are environmental and cultural. I think the former will be neutralized, and I think the latter will be neutralized with the increased flow of ideas between cultures. The "Protestant Ethic" and the "Jamaican Laziness" will cancel out. Cultural mores will eventually merge and equate. Thus, I see no essential (necessary) reason why American hegemony will surive in the long term. Environmental and cultural factors will be irrelevant in the long run. Thus, maybe I'm misinformed or naive, but the way I picture a totally liberalised global economy is one that is essentially (in the long run) equitable. CAVEAT: My idea is based upon rational actors who play by the rules. Cheaters always win, and I'd imagine that cheaters will take advantage of the developing world and keep them there. Thus, cheating prevents cultural and environmental factors to prevail and creates other factors that will ensure an inequitable world. In essence, Americans (businessmen and politicians) will not want to lose hegemony and will cheat to maintain it. PS: I thought of this at 1:40AM. It might be crap.